St George's was consecrated in 1831. During the 1950s and 1960s the surrounding area saw extensive development, and the church couldn't cope with the resulting population growth. 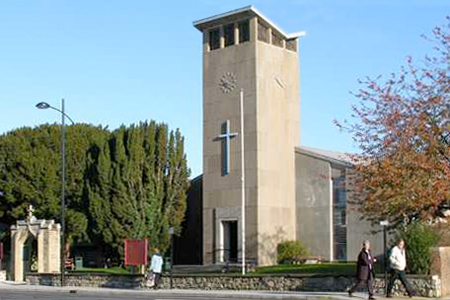 Plans for a new church were started and in 1970 the new church was built on the site of the old, retaining some parts of the original building. The outside looks very grey and forbidding. But do not be put off, as inside is bright, modern and almost minimalist. Over the high altar is a very dominating crucifix with Christ looking very much in torment, but still a striking piece. The organ is situated in a loft at the back of the church, and the choir (only four members) were with the organist upstairs. They host an annual music festival, which from the pictures on the website looks to be a big success and loads of fun. Waterlooville lies a bit north of Portsmouth. The village was originally known as Waitland End and consisted of only a handful of cottages. Legend has it that Wellington's soldiers stopped at a local pub for refreshment on their return journey from the Battle of Waterloo in 1815, and thus the village became known as Waterlooville. Growth continued in 1897 with the advent of the Portsmouth to Horndean light railway. By the 1960s, growth was rapid. St Georges is across the road from a modestly sized ASDA, England's second-largest supermarket chain, and behind the main shopping street of Waterlooville. The church car park is very bijou, but I parked in ASDA (handy for shopping on the way home!). Not certain, as nowhere did it say who was doing what that I could see. However, I guessed it was the Revd Ray Chapman, honorary assistant priest. I was welcomed by a chap outside the church and by two people on entering the church, where I was given the service pamphlet and a weekly news sheet. Modern movable pews with thin cushions, but comfortable. Church bells as we entered mingled with exuberant children and the more subdued chatter of the adult congregation. There was even some laughter (adult). "Good morning. Welcome to St George's." BBC Songs of Praise (the hymn book); New English Hymnal; Alternative Service Book. There was also the church's own eucharist pamphlet and a weekly news sheet with the collect, readings, responsorial psalm, etc. I chose the wrong place to sit as I was by where the small children congregate and they were very boisterous and noisy. However, I would always defend their right to be in church no matter how distracting they are, as they are the congregation of the future. One child was removed when it cried lustily. The church is very echoey and all the speakers (amplified) resonated around the space. Middle to high. Bells but no smells. The officiating priest wore a chasuble and there were four white robed helpers. It was a sung service. 8 – He spoke quite quickly, but thankfully clearly. He mentioned that he and his wife had just returned from France, where they had followed the tracks of earlier pilgrims. He also spoke about motor homes – he apparently likes motor homes. People leave tracks of pilgrims and tracks of faith. We need to follow these tracks but also lay down our own for others to follow. Jesus knows what it is to be human ("Been there, done that, got the t-shirt") so we are never alone. Life is full of ups and downs and Christ will always be with us. The sermon, and the choir's anthem, "God be in my head," which I own up to being one of my favourites. Despite only having four women, they made a beautiful and celestial sound. The children (but I still defend their right to be there). I was confused when the responsorial psalm was omitted and we went straight to a hymn without any announcement. For some unknown reason, an elderly lady sitting two rows in front of me glared at me for what felt like a good two minutes! There were no sidespeople to direct us up to communion, so I sort of followed the flow and hoped I hadn't trodden on anyone's toes. An elderly gentleman gathered up my service pamphlet from me, then another invited me into the hall for coffee. The priest recognised me as a new face and was very pleasant. He asked if I was new to the parish. Coffee and tea with a variety of biscuits. The coffee was fair trade (fair trade jars in evidence). Lovely cups and saucers and acceptable biscuits but no one spoke to me in the hall. 8 – They seemed a friendly bunch, so I would be happy to join them, maybe even swell the choir numbers. Absolutely. I left feeling spiritually recharged. The sermon and the boisterous children.